A travelling carnival with acts of inexplicable paranormal magic and illusion appears in a small town. But when an unidentified man’s body is discovered beneath the carousel FBI agent Michal Travis is sent to investigate. In America the 1950s was a time most would want to forget. Increasingly right-wing government and law enforcement agencies, obsessed by the spread of Communism, went to ever-greater and ever-wilder lengths to combat the threat. Welcome to the weird and wonderful world of the Carnival Diablo, the dark secrets at its heart – and also at the heart of the country which hosts it. FBI agent Michael Travis is sent to discover if a murder on the carnival site is actually a Federal crime. Travis is the archetypal agent – buttoned up, committed, convinced that what he does is for the best of America. He has sublimated his own unfortunate childhood – his mother killed his father and he spent time in a juvenile ‘home’ – but is still haunted by the belief that he may have inherited his father’s tendency to drink and violence. This is a typical Ellory slow-burner, a book of immense intrigue marked by its strong character creation and development. Historical fact is blended with justifiable speculation – and one or two of the wilder conspiracy theories of the time – to leave any thoughtful reader with plenty of questions. Is the character of Travis merely a symbol for uptight America? Are the strange cast of the carnival a representation of the era of ‘freedom’ which followed. What is the real relationship between big business, political power and law enforcement? How much do people ever know about what their government is doing? The book is written in the third person and almost entirely from Travis’ perspective. While the main focus is in the present, a well-handled back story provides both insight and motivation for Travis’ actions – and carefully sets him up for the denouement. Ellory’s characters always have depth and dimension, but carnival boss Edgar Doyle is one of most charismatic – and gradually builds to share centre stage with the baffled agent he tries to convince of the basic wrongness of the code on which he has built his life. As the story reaches a dramatic showdown, Ellory hammers home his salient point. The innate decency of ‘ordinary’ people saved America from what was fast becoming a political nightmare. But those people needed inspiration – provided by the carnival’s collection of what many would see as freaks, weirdoes and dreamers. 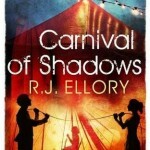 Carnival of Shadows is hardly a crime story, more a morality tale and social commentary, but Ellory is a master plotter and this is him at his very best – an uncomfortable, but ultimately rewarding read, which leaves as many questions as it answers. John Cleal is a former soldier and journalist with an interest in medieval history. He divides his time between France and England.